We Believe in Quality of Life in Harmony with Nature! Welcome to The Tanusas Community, the first development in Boca de Cayo, a new destination in the Province of Manabí, located 80km south of Manta. Tanusas unique experiences will inspire your senses. Discover the secrets of this uncharted paradise when you indulge in excursions to nearby beaches and villages. LIVE THE TANUSAS EXPERIENCE: Come and see this impressive development and get breakfast, lunch, dinner and accommodation FOR FREE, with the purchase of your dream lot. If for some reason you think this is not for you, you can still stay with a 30% discount for the first night. A private oceanfront resort that is entirely dedicated to sustainability! Located 80km south of Manta in Boca de Cayo, a small quiet fishing village with friendly and welcoming people in the province of Manabí, Tanusas Villas is so much more than a traditional real estate development. Our exceptionally low density community consists of 84 unique single-family home sites in a total of 47.95 Hectares (18.50 Acres) of tropical dry forest within three neighborhoods: Pacific View Villas, Forest Villas and Organic Farms. Here you will enjoy Beach Front Access, Panoramic Views of the Pacific Ocean and Forest Views. Lots start at US$70 / sq mt. Each home site is carefully designed to ensure privacy. Locations are available with an elevation variation between 0 and 12m (0 and 39 ft). Ownership opportunities start from 1.000 m2 to 1.600 m2 (10,764 ft2 to 17,223 ft2) with Beachfront, Sea Level, and Ocean View Level. All home sites are in a privileged location, with close proximity to the beach and the Tanusas Retreat & Spa facilities. We have created a sense of community and a range of amenities to live a life without boundaries. The Pacific View Villas lay over a 15.51 Hectare (38,33 Acres) plot that share common grounds with Tanusas Retreat & Spa, one of the most renowned hotel destinations in the country, consisting of 35 homesites with options of one, two or three bedrooms. Its architectural design fuses the features of a conventional home with the functionality and comfort of a 5 star hotel, allowing owners to use their villa as a main residence, or as an investment opportunity to generate income through Tanusas Retreat & Spa’s signature Management Rental Program. ▸ HOMEOWNER’S COMMUNITY FEES - Ask how you can avoid the HOA expenses. ✓ Anything related to the community areas such as playgrounds, walking trails, public lighting, etc. The cost for the Homeowner’s Community Fees are estimated at 0.20 cents per square meter of land surface. As a Tanusas homeowner, you and your guests are entitled access to all the hotel amenities, and discounts on food and beverages. Membership fee is fixed at 0.10 cents per square meter of land surface. Our community builds its foundation by embracing sustainability in every possible way. Our commitment to sustainability can be seen through our utilization of solar hot water heaters, public lighting photovoltaic systems, wastewater bio treatment systems, environmentally friendly building materials and construction techniques, drought resistant landscaping, 5 star energy friendly appliances, LED lighting, electrical systems according to US NEC NFPA standards, waste recycling systems, and much more. Our community consists of 32.44 hectares (80.16 Acres) of green areas and natural reserves. Alternating with the streets is an extensive system of pedestrian/bike paths, running through common areas that show off a variety of landscaping, garden areas and play areas. Most houses face these green areas rather than the streets, so that the emphasis in the village is on pedestrian, wheel chairs and bike travel rather than cars. A selection of native trees, plantain, papaya, and cocoa forest help to form a large element of the landscaping in the property and contribute significantly to the food supply for the residents. ★MISSION - Our strategy is to provide Development Security. Our mind is set to build a community with a sense of uniformity and high standard service platform, a Management Sales and Rental Office on site ensures your investment in many ways and makes life in Ecuador easier. An Architecture design catalogue is available to ensure architectural diversity within our standards. TANUSAS VILLAS is located a few minutes away from countless adventures, such as the best scuba diving and whale watching at the exotic Isla de la Plata, kayaking at the rough Boca de Cayo streams, hiking through the paradise of a humid forest in Canta Gallo, mountain biking through the hills of Chongon-Colonche, and much more which allows you to escape and free your spirit. Another feature of our community is Tanusas Retreat & Spa. This hotel has gained a high level of prestige, providing a variety of luxury services perfectly in tune with nature. 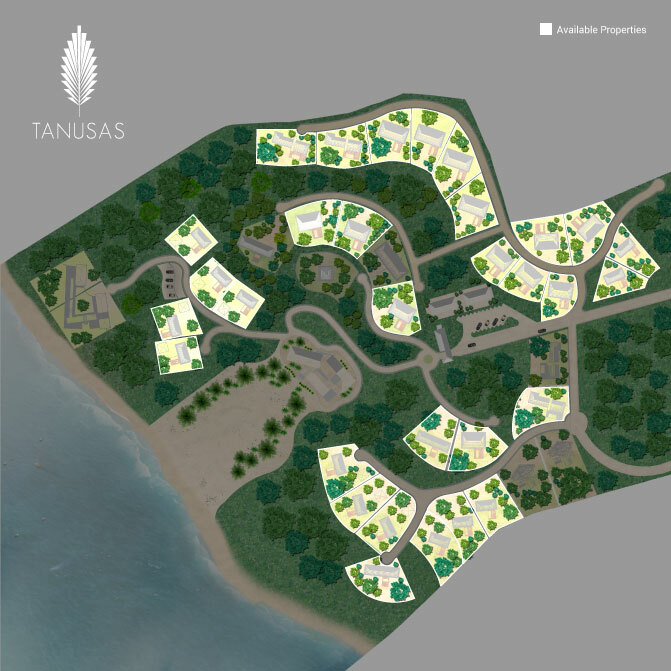 Tanusas began in 2012 promising an environment dedicated to quality services & amenities, environmental preservation, and extended sustainability as well as a unique community charm. Along with the hotel comes an on-site culinary experience offering the highest quality gastronomy through the restaurant BocaValdivia. Award winning Chef Rodrigo Pacheco was trained in France and has worked in restaurants that received three Michelin stars, which is a prestigious honor symbolizing culinary excellence. Chef Rodrigo Pacheco utilizes fruits in the tropical dry forest, growing his own cacao in the cloud forest, fishing and collecting shellfish in the mangroves, and working with indigenous communities to discover ingredients that have never been applied to fine dining. The gastronomic proposal in BocaValdivia is pure creativity. We serve delicacies with an ocean view. There are many privileges attached to living in a community with a hotel that has a passion for quality service, from room service at your door step, flight and transportation arrangements, concierge, property management, and much more. We take pride in our local community and the culture & traditions that make life so much more exciting. Long ago in these magical lands the Valdivia culture lived, one of the oldest settlements recorded in the history of the Americas. The Valdivia settlement emerged from the earlier Las Vegas culture and thrived on the peninsula between 3500 and 1800 BC, passing along through generations the great spirit of creativity to our people. We embrace a rich culture full of traditions that are kept alive to this day through artistic expressions. We value the techniques passed down through generations for creating beautiful pottery and maintain our identity as some of the most spectacular straw hat weavers in the world. We treasure our land offering the finest coffee and are thankful for the hard work of the farmer that brings this aroma to our doorstep. The values and richness of our culture inspire us to continue the line of creativity through nature. We have inherited a true connection to nature to be shared and explored with others who share our philosophy of life. Tanusas Villas Mentor and promoter Samih Sawiris is a leading developer of integrated towns with a strong foothold in Egypt and the Middle East. With the alpine Andermatt project in Switzerland, we have expanded our activity outside this region and into Central Europe. Our primary business is to develop, construct and manage tourist destinations with several projects at different stages of completion across eight jurisdictions.